Dr. Michael E. DeBakey was one of the most visible American surgeons of the late 20th century: he pioneered surgeries, published extensively, advised presidents, and tended to many celebrity patients. The hands-on and innovative approach he took to surgery extended beyond the operating theater—ever since his early training under the direction of Dr. René Leriche he styled himself as a tinkerer as well. One of the lesser known of DeBakey’s early prototypes—a collaboration with Dr. George Lilly, a former colleague from the Tulane University School of Medicine, and Mr. Charles “Ernest” Schmidt, a mechanical engineer and his former roommate at Tulane—was a blood transfusion apparatus that the pair hoped to design as a new model of affordable medical technology. 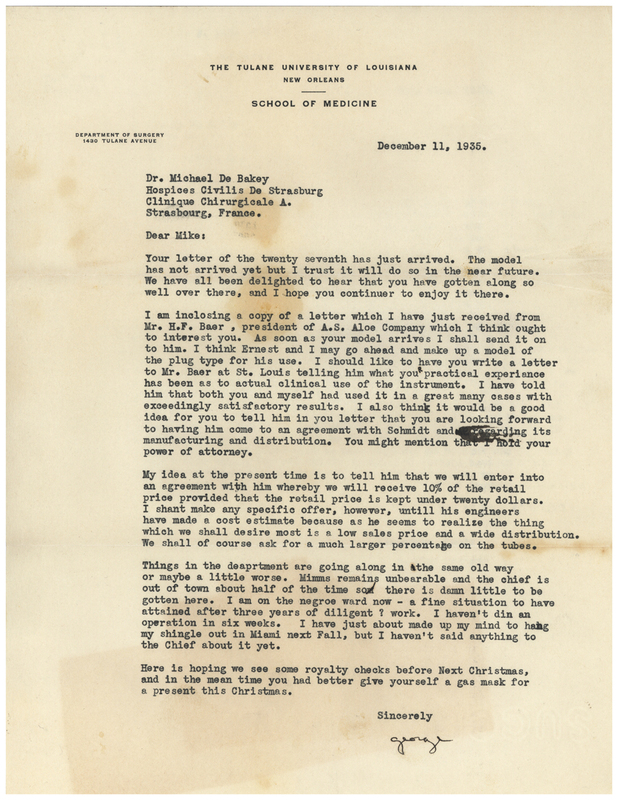 George Lilly to Michael DeBakey, December 11, 1935. Box 5 Folder 34. H. F. Baer to George Lilly, December 4, 1935. Box 5, Folder 34. Yet both of these goals were complicated by the transition to mass production for the market. At the outset, it seemed that the manufacturing company that they contracted with, the A. S. Aloe Company of St. Louis, Missouri, was in agreement with their target price range. In a letter, the company’s president wrote that he was primarily concerned about sales volume and that keeping the retail price to “considerably less than $25.00” would be essential to make the device profitable. DeBakey’s simple design played a key role in realizing this, as it kept manufacturing costs low. Michael DeBakey to H.F. Baer, January 8, 1936. Page 1. Box 5, Folder 34. Michael DeBakey to H.F. Baer, January 8, 1936. Page 2. Box 5, Folder 34. Michael DeBakey to H.F. Baer, January 8, 1936. Page 3. Box 5, Folder 34. Michael DeBakey to H.F. Baer, January 8, 1936. Page 4. Box 5, Folder 34. By the time the manufacturer had perfected the mass-market prototype and was ready to proceed with selling the instrument, however, the planned retail price had soared to $39.50—nearly twice the original goal. Minor improvements, such as adding a cc. counter and a ratchet to prevent the handle from being turned the wrong way, had driven the manufacturing costs up considerably. At the same time, Aloe wanted to be sure that the device remained profitable even after their advertising and royalty costs were covered. Royalties also proved a particular sticking point for the three patent holders. After initially agreeing to a 10% royalty rate, Aloe informed Drs. DeBakey and Lilly that the best they could do would be to pay royalties on the basis of 10% of the manufacturing cost, which was just $22.50. The need for profitability prevented them from being able to offer royalties on the full retail price, which the company and inventors all agreed they absolutely had to keep below $40.00. H.F. Baer to Michael DeBakey, May 27, 1936. 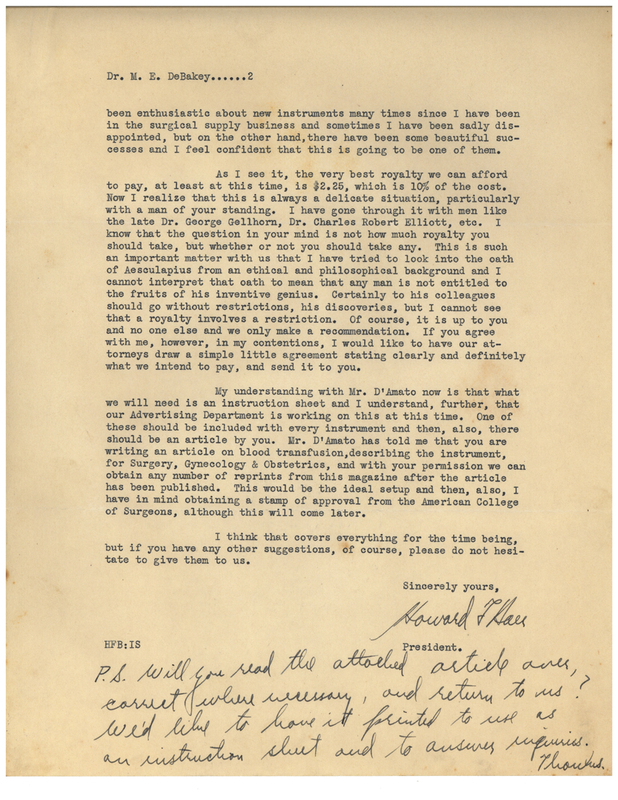 H.F. Baer to George Lilly, Sept. 21, 1936. Baer to DeBakey, Sept. 14, 1936. If Dr. DeBakey had never expressed reservations about accepting royalty payments for his inventions, the royalty dispute troubled his two co-patent holders considerably. DeBakey had given the instrument his name and was far more concerned with perfecting its operation and getting it into as many hands as possible than with arguing over profits and royalty contracts. They therefore proceeded with the deal, and the Aloe Company sold just 108 DeBakey transfusion instruments between July 1936 and the end of February 1937. Sales tapered off throughout the rest of that year. Despite the best of intentions, Dr. DeBakey could not find a way to mass produce a simple and affordable blood transfusion instrument. The manufacturer’s demand for profit and marketability ran counter to his vision of an accessible instrument that individual physicians could afford. Mr. Schmidt, the engineer, suggested simplifying the device further and lowering the price. Dr. Lilly, upset over the royalty sharing agreement and particularly with a perceived slight over reimbursement for a patent attorney’s fees by Mr. Schmidt, would soon pull out of the deal. Dr. DeBakey, for his part, continued to tinker with the transfusion instrument in his own medical practice. C.E. Schmidt to George Lilly, April 22, 1937. 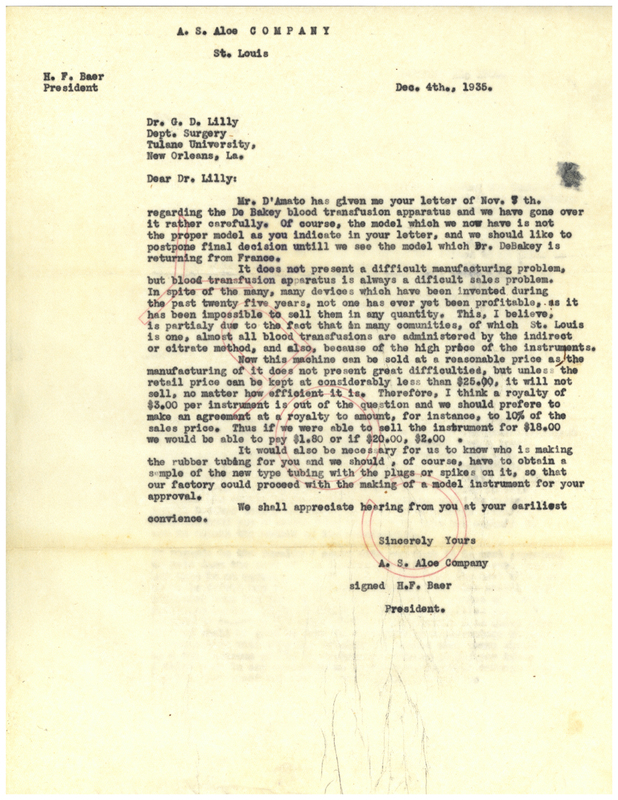 George Lilly to C.E. Schmidt, Oct. 28, 1937. This early experience laid the foundations for his persistence in inventing other longer-lived and much lauded devices including the Dacron graft, a left ventricular assist device (LVAD), and the artificial heart. Throughout his career, Dr. DeBakey saw himself as a technological innovator committed to improving surgical practice, even if the realities of manufacture often proved a challenge. Heidi Morefield, M.Sc., is a Ph.D. Candidate in the history of medicine at Johns Hopkins University. Her dissertation focuses on the history of the appropriate technology movement in international health. She was a Michael E. DeBakey Fellow in the history of medicine at the NLM in 2017. We invite interested individuals to learn more about the Michael E. DeBakey fellowship program, and about the current call for applications to the program, which are due September 30, 2017.